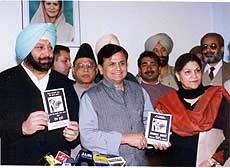 The Congress charge sheet , which accuses the SAD-BJP government of ‘‘total failure on all fronts’’, has turned out to be a ‘‘damp squib’’ as it is a conglomeration of allegations and charges being made by the state leadership against the ruling alliance from time to time, especially during the past couple of months. This native village of Chief Minister Parkash Singh Badal which has produced several MPs, ministers and MLAs in the past more than four decades apart from giving a Chief Minister thrice, has been witnessing a change in political equations and loyalty. The ancestral village of two self-styled chiefs of the Khalistan Commando Force (KCF), Panjwar, where only one vote was polled during the boycott of the Akalis in February 1992, that too by Mr Gurdial Singh Dhillon, a former Speaker of the Lok Sabha, hums with poll activities these days. Under the security cover norms decided for the candidates contesting the Punjab Assembly elections, those belonging to the recognised and registered parties will have four security personnel each while the remaining candidates will have two security personnel each. The vehicles to these personal guards will be provided by the candidates. The impact of the division in the state BJP is more visible in the Amritsar (Central) constituency from where firebrand sitting MLA Ms Laxmi Kanta Chawla of the party is seeking re-election. Sources in the party said Mr Daya Singh Sodhi, a former state President of the party who belongs to the ‘Tandon group’ has launched a ‘silent campaign’ against Ms Chawla. “It was the demand for autonomy that had put Punjab in deep trouble during the past two decades,” says the Punjab Pradesh Congress Committee chief, Capt Amarinder Singh, advocating a strong centre. “Two favours at the cost of one” is the motto of an Independent candidate, Mr Bhajan Singh, who filed his nomination papers here yesterday. “Though he mentioned ‘Muftkhorra Club’ as the name of his party, we are treating him as an Independent,” says Mr Pradeep Sabharwal, Returning Officer for the Khanna Assembly seat, maintaining that “Muftkhorra Club” does not figure in the list of either registered or recognised parties of the Election Commission. In protest against the allotment of Congress ticket from the Sunam Assembly constituency to Mrs Sonia Arora, a daughter of late Bhagwan Dass Arora, former Congress MLA, from here, in the current Assembly election, Mr Amandip Arora, a son of Bhagwan Dass Arora, has also decided to contest as an independent from here against her sister as rebel Congress candidate. He filed his nomination papers here yesterday. Mr Ashwani Kumar, chairman, intellectual cell of the AICC and senior advocate of the Supreme Court told reporters here today that the SAD-BJP government had failed to properly represent Punjab’s case regarding the distribution of the river waters as a result of which the Punjab Government had been directed to complete the Sutlej-Yamuna Link Canal in the state in a year. He added that the decision had given rise to a constitutional problem. The electioneering of Mr Sukhpal Singh Khaira, a Congress nominee from the Bholath Assembly constituency, has got a boost with more than 45 prominent workers and leaders of the SAD leaving the party and deciding to support Mr Khaira. Fissures have appeared in the Panthic Morcha here. While SAD(A), a constituent of the morcha, has fielded its candidate Mr Baldev Choudhary from the Phagwara (Reserved) Assembly constituency, the entire local leadership of SHSAD, another constituent of the morcha, has declared its support to Mr Harbhajan Singh Balalon, the BSP candidate. The Panthic Morcha, particularly the SHSAD, suffered a big jolt today when Mr Bhupinder Singh Bhalwan, SGPC member and confidant of Mr Gurcharan Singh Tohra, SHSAD President, resigned from the primary membership of the party and joined the SAD in the presence of Mr Sukhdev Singh Dhindsa, Union Minister for Chemicals and Fertilisers, and the Secretary-General of the SAD, Mr Gurcharan Singh Fatehgarh, among others. Mr Kulwant Rai Aggarwal, senior vice-president, District Congress Committee (DCC), who has jumped into the election arena as a rebel candidate against the official candidate of the party, Mr Surinder Singla, said the contest was between an “insider” and an “outsider”. The candidates contesting the Assembly election are required to intimate the authorities concerned about the vehicles used for campaigning and get special stickers, which are to be pasted on their vehicles so that the expenditure on vehicles could be accounted for. Mr Rajbir Singh Sidhu, who has been fielded by the newly floated General Samaj Party (GSP) from this constituency, said the main plank of the party would be putting an end to the caste-based reservation extended to the creamy layer, in some cases. After scrutiny of the nomination papers for the Kharar and the Morinda Assembly segments, papers of at least five candidates for the Morinda seat and 12 candidates for the Kharar seat were cleared by the respective Returning Officers. Members of the Punjab unit of the Bhartiya Kisan Union (BKU) today criticised Chief Minister Parkash Singh Badal for his failure to solve the SYL canal issue and said the union would launch a statewide stir even if a single drop of water was given to any of the neighbouring states. The Sikh Regimental Centre, Ramgarh, will organise a recruitment rally in Chandimandir from February 4 to 24 for the selection of soldiers (general duty and clerk), a statement issued here said. Following the auction of vehicles by the government, the Farmers’ Training Centre at Khalsa College is awaiting sanction of vehicles to carry out its functions which include creating awareness among farmers about the latest farming techniques and bringing benefits of the green revolution to the grassroots level by holding camps in villages. Mrs Sukhwinder Kaur was allegedly murdered by her husband Manohar Singh with kirpan. She was resident of Guru Arjan Dev Nagar here. According to the FIR the police party while patrolling the locality heard shouts of a woman. Students from Punjab, who have done their Certificate Course in Physical Education (C.P.Ed) from Kurukshetra University, (Haryana), are finding it difficult to get government jobs in their home state as the government concerned has allegedly declared the diploma ‘invalid’.